When you upload a video to YouTube, one of the optional fields lets you enter the place where the video was recorded. Now you can restrict YouTube's search results to videos from a certain location. Just click on the "advanced" link next to the search box, type your query, enter the location and click on "show map" to adjust your location. YouTube automatically detects locations from queries, so it's not necessary to use the advanced search options. A search for [live szeged] displays a small box with four geocoded videos that can expanded to see all the results. 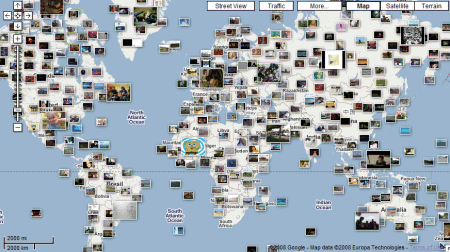 Another way to find YouTube videos recorder in a country or city is to add the YouTube mapplet to Google Maps. In some cases, you can just search for a location, select "Explore this area" and then click on "More videos" to enable the mapplet. Is there any special reason you have chosen Szeged? There's a cool music festival.